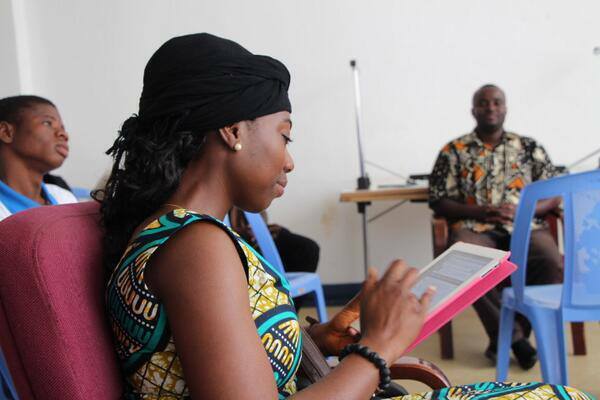 Jemila – Twitter chat moderator expert reading through her tweets. Purpose of the chat: Ask yourself what you want to achieve with the chat and what you want participants to learn from the chat. Develop and create engaging questions or topic: The main topic for the chat/debate should sound interesting for people to join the chat. Ask “How” and “Why” questions and not “Can” questions. The former allows for more contribution from participants while the latter restricts people to either agree or disagree with the topic. In the case of Twitter debates, “Can” questions are employed, but are typically followed up with “Why” for further elaboration by participants. Read widely about the topic: As a moderator of the Twitter chat/debate, you should have a good grasp on the issues in order to guide the conversation. Read widely on the topic to be discussed, focusing especially on the questions that will steer the conversation. That said, you don’t have to be an expert on the topic – instead, include one or two experts on the panel and direct complex questions to them for further insight. Do not leave any major stone unturned. Some participants are experts in the topic so you need to prepare well. Time zones: Choose your time very well. Pay attention to the time zone of your audience and availability of guests (if any). State the time clearly when promoting the chat. Promote the chat! Tweet at potential participants: Use the Twitter search feature to search for the hashtag and the topic you are about to discuss. Identify and send tweet invites to specific Twitter handles regarding the upcoming chat. Send out periodic reminders about the chat – a day or two before the chat – state the topic, hashtag, time and guests (if any). Reach out to organisations and networks with an interest in the topic and request that they share with their members. A day or two to the chat day Let people know and understand what it’s all about – Promote the chat days before and consistently remind people about it. Start on time: Start at the stated time. Welcome all (don’t forget to mention them, that’s some rapport building), make room for selected participants to introduce themselves and introduce guests (if any) to the audience. Let your audience know if you are running late and use the opportunity to find out who is tuning in and where from. Ask the first question: Do not ask the main question now, tweet the sub-question as your first question. Example, if the main question is “How can we create jobs?” the first question should be “Why are there not enough jobs in the market?” The idea is to get people more engaged before the main topic so you can make good use of the time and discuss the topic broadly. Tweet at participants: When asking questions, mention participants’ Twitter handles. It makes them feel part of the conversation and not left out. See if everyone is tweeting and then tweet at the silent tweeps. Monitor both the event hashtag and the account you are tweeting from to ensure you don’t miss anyone. Don’t just ask questions, Interact! : Allow people to share their thoughts on each question you ask before tweeting the next question. Engage with the audience, join in the conversation. If you are tweeting from your personal account, share your own thoughts. If you are tweeting from an organizational/company account, tweet about overlaps or linkages from that perspective. Let the conversation flow, quote and retweet participants. You can allow people to comment for about 5-10mins before you ask the next question. Be in control: You are the moderator so be in charge of the conversation. Some participants are likely to divert the discussion. You will need to direct the conversation so such participants don’t distract others. You can do this by tweeting at specific handles and asking them if they agree with a particular tweet by another participant. Reiterate and Ask follow-up questions: Read the discussion and look out for some questions that can be generated from the tweets from participants. Where necessary, recap key points to ensure everyone is on the same page. It also helps in clarifying submissions. Retweet as much as possible: Use the search feature on Twitter or Twitter fall to track the participants using the hashtag so you can retweet them, which is a sign that you are reading their tweets. That said, don’t be repetitive with the retweets – be mindful of the 100 tweets per hour/1000 tweets per day limit. Twitter jail looms. Have a backup account for takeover if necessary. Manage time: As moderator, it is your duty to manage time and ensure that the key aim(s) of the chat are achieved in the allocated time. It’s easy to get carried away, especially with an interactive chat. Close on time and keep participants in high expectation for the next Twitter chat. Express gratitude to participants, guests and event organisers: Leave on a high note. Say thank you to all who made the chat possible and interesting! Document the chat: You can use storify to document the chat or submit it to Global Voices Online for publication. Share the storify article with your audience for those who missed the chat. Evaluate the conversation: Assess the whole conversation to find out if the right message was communicated or if the intended purpose for holding the chat was achieved. Cecil Kwamena Ato Dadzie (@GhanabaKwamena), social media strategist, blogger and Youth Development Advocate. Kofi Yeboah (@Kofiemeritus), social media strategist, blogger and Communications Officer for Clean Team Ghana – an organisation that provides innovative and portable toilet facilities to the urban . Thank you to our editor Jemila Abdulai (@JAbdulai) – Founder of Circumspect.